‘Listen To My Nerves Hum’ is the title of the new album from Norwegian pianist/composer, Benjamin Finger. This gorgeous new collection of piano instrumentals is a brand new release on the awe-inspiring independent music label, Time Released Sound. It’s been only a week ago that I have crossed paths with the label’s roster of talent. Despite this, I feel closely drawn to the people and moreover, the ethos of Time Released Sound, as if I have always known about their existence and deserving activities. Amazingly, the label was founded in 2011, and since then a plethora of compelling and innovative records have been released from the Alameda art studio/headquarters. The releases are lovingly hand-made, limited edition runs that conveys the importance and utmost significance of their championed artists. One artist is Benjamin Finger, and what an artist he is. Finger is not only a renowned composer, but also has made significant ground in both film and photography. He was educated at Oslo Photo Art School before he started to study fiction film to become a director of the film and TV Academy (NISS) in Oslo. Since then, he has done several short films, music videos and participated at various photo exhibitions. Now, Finger operates as a freelancer (director/photographer), composing music is just one of the many facets of the gifted Norwegian’s rich endeavors. What I love most about ‘Listen To My Nerves Hum’ is its intimate feel. At times, a brooding mood envelops the headspace yet there is also a calming quality that radiates from the piano notes. I feel the tenderness in Finger’s playing throughout, reminiscent of Germany’s Nils Frahm. Similar to Frahm’s use of felt to dampen the sound, the tranquil mood of solace is never far away. The piano instrumentals are based largely around various deceptively repetitive piano movements. The effect is profound as a gorgeous ebb and flow is inherent in the framework of the sonic tapestry. ‘Listen To My Nerves Hum’ is one of those special albums that you believe you have known all your life. The most striking element to Finger’s sound is the technique he uses to construct the piano compositions. These stunning piano movements are layered with added use of voice overs and field recordings. New dimensions are created as a result. The field recordings of singing birds on ‘Bogatynia in mother’ conjures up the colours of spring that echoes the beautiful pastures of ‘From Gardens Where We Feel Secure’ by Virginia Astley. Similarly, firecrackers are heard throughout ‘Ano nuevo acid crackers’ where the new year’s celebrations provide an ideal backdrop to Finger’s introspective piano playing. A feeling of nostalgia is etched on the canvas of sound. My personal highlight is ‘Sevilla on tape’. The sound is captivating. A beguiling voice is heard over the meandering piano melody that cries a river of tears. An unerring emotional depth lies at the core of this sublime track. The blend of voices (children’s voices are heard in the opening stages) are interwoven with the hypnotic piano notes that forms one cohesive sound. I feel the recording shares the kindred spirit of Nicolas Jaar’s production work. ‘Road To Salena’ comprises of meditative piano with subtle use of voice segments towards the song’s close. The slow piano melody is brighter in mood where an introspective moment descends upon the listener. Likewise, ‘Leaving Linjevegen’ is a colourful piece that has no use of added samples. The following track ‘Das paris des second empire benjamin’ contains a French spoken word segment wonderfully embedded in the tapestry of Finger’s ethereal piano music. ‘Listen To My Nerves Hum’ was mastered by Lawrence English. The release comes in a deluxe limited edition form, of a hanging sculptural/skeletal bird mobile made from the parts of antique pianos. The distinct blend of piano music created by Finger is a rare treasure for all fans of modern classical and ambient music. Benjamin Finger’s debut album ‘Woods of Broccoli’ was released on How Is Annie Records and follow-up ‘For You Sleepsleeper’ came out in 2010. 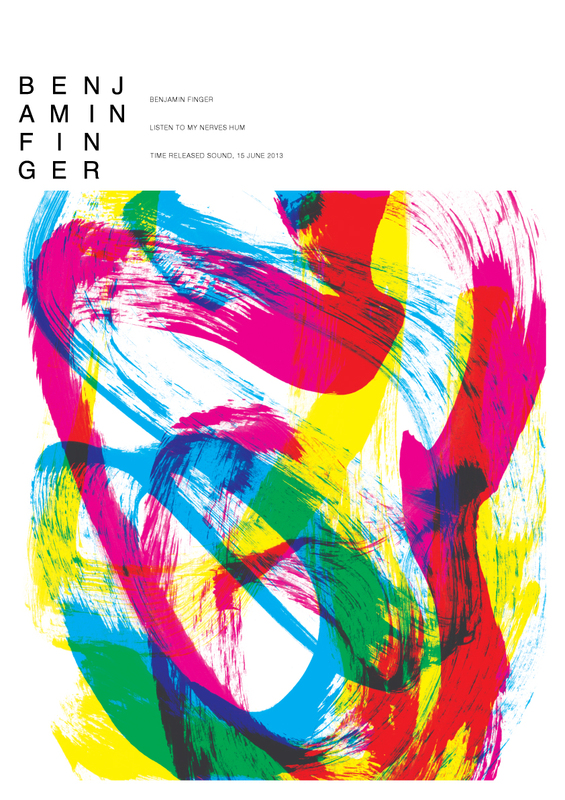 Finger is also one half of the electronica duo Beneva Vs Clark Nova. ‘Listen To My Nerves Hum’ is out on 15 June on Time Released Sound.